Canonized in 1991 by Saint Pope John Paul II, Raphael Kalinowski was the first male Carmelite to be raised to the altars since St. John of the Cross. 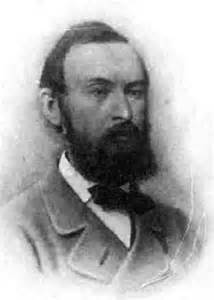 Born in 1835 in Vilnius, Poland, which at the time was under Russian rule (formerly a Polish-Lithuanian territory), Joseph was the second of nine children of Andrew Kalinowski, who remarried twice after the death of Joseph's mother Josephine Polanska. 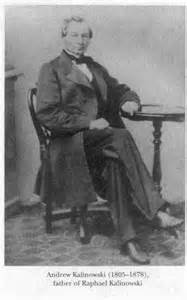 Like his father who taught mathematics, Joseph excelled at math and engineering under the patronage of the Imperial Russian Army, which he joined at the age of eighteen. 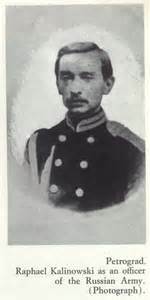 Although promoted to Lieutenant and then Captain, Joseph resigned from the Russian army in 1863 to join the Polish uprising in the Vilnius region, a choice which cost him dearly. In 1864 he was arrested and sentenced to death, but his sentence was commuted to ten years in the labor camps after a treacherous nine-month trek through the salt-mines of Siberia. He was able to continue some of his scholarly work for the Russian Geographical Society during the later years of his imprisonment, and then he was released 1873. Exiled from his homeland of Lithuania, Joseph went to Paris and then returned to Warsaw, where he became the private tutor of Prince August Czartoryski, who later became a priest and was beatified by Pope John Paul II in 2004. In 1877, Joseph joined the Carmelites in Linz, where he was given the name Raphael of St. Joseph. He was ordained a priest in 1882 at the monastery in Czerna, where he served as prior beginning in 1883. 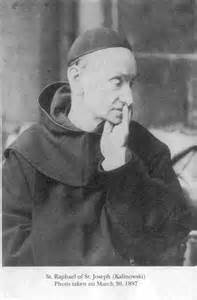 From there, St. Raphael Kalinowski worked to establish the Carmelite monastery in Wadowice, where he served as prior. He also helped to found two Carmelite monasteries for Discalced Carmelite nuns. He died in Wadowice of tuberculosis in 1907 where, fourteen years later, Pope John Paul II (Karol Wojtyla) was born.